At an event held in Berlin at IFA 2017, Acer has announced a new addition to its Chromebook 15 lineup. The new device comes with the all new aluminum design and is also the only Chromebook with 15.6-inch display. The device boasts of full HD IPS display available in both touch-screen and non-touch screen configuration. The company claims that it has a long battery life of up to 12 hours. The device will support Android apps via Google Play Store when it is launched so customers can have access to all apps required. At the IFA 2017 being held in Berlin, Acer has launched two new projectors; the Acer VL7860 for home cinema enthusiasts and the Acer P8800 for larger venues and rooms, ideal for work purposes. The Chromebook 15 has upward facing speakers that also support high-definition audio and improves volume and audio range. It has a full-sized key-board and has a wide 88-degree field of view HD webcam. The new Chromebook 15 boasts of a fan-less design which ensures the device doesn’t make too much noise. It has dual-core Intel Celeron and quad-core Intel Pentium processors to enhance performance. The device will be available with 32GB or 64GB of eMMC storage with 4GB or 8GB of RAM. The Chromebook 15 feature an aluminum top cover with backlit keyboard allowing greater usability and only weighs about 1.72 while measuring 378 W x 256 D x 18.9 H mm. On the connectivity front, the device supports Wi-Fi, USB 3.1 Gen 1and a Type C port, Bluetooth 4.2, 2 USB 3.0, 1 HDMI port and a combo of 1 headphone jack and 1 speaker jack. The SD card reader can support up to 128GB for transferring and saving files. 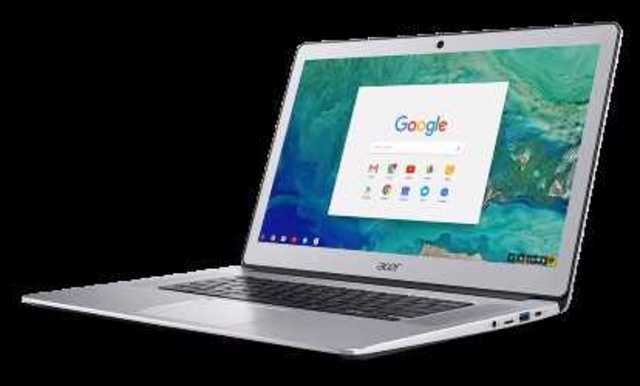 The price and availability for the Indian market hasn’t been confirmed yet but the Acer Chromebook 15 will be available with either a touch screen display (CB515-1HT) or non-touch display (CB515-1H). The device is said to be available in the US market starting October.